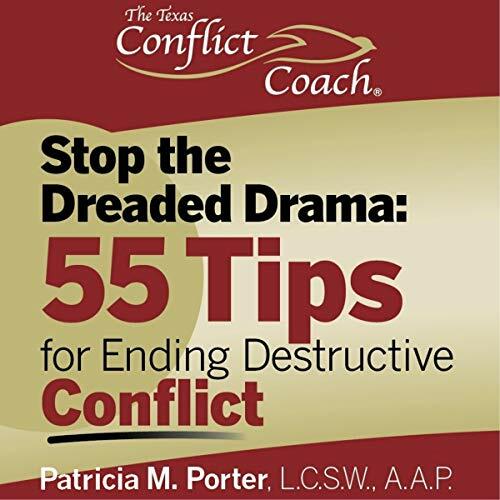 Stop the Dreaded Drama: 55 Tips for Ending Destructive Conflict provides you with reliable strategies for moving out of unhealthy and destructive conflict. The tips are divided into seven sequential sections that walk you through the conflict resolution process and prepare you to successfully engage the other person in a conflict situation. By implementing these strategies, you are well on your way to ending the dreaded drama! The first section, "Analyze the Conflict", describes the initial steps you need to take to remove yourself from an emotionally-charged and destructive path and to better understand the true nature of your conflict. The second section, "Overcome Conflict Dread", addresses the angst you often experience when dealing with ongoing conflict. It helps you identify underlying triggers and gain control over intense, negative emotions that can lead to destructive conflict behaviors. Section three, "Got Perspective? ", addresses the importance of perspective and how it is crucial to understand conflict from all sides, and more importantly, to move the process forward. The fourth section, "Prepare for Difficult Conversations", addresses the importance of preparing for a difficult conversation, so you are empowered, focused, productive and constructive. You will reflect on key questions presented in this section. Section five, "Establish a Structure for Conversation", gives you tips for how to put a structure and process in place to effectively facilitate the conversation without an outside neutral party. The sixth section, "Facilitate the Conversation", gives you specific strategies to help keep the dialogue on track in a productive and constructive manner. The final section, "After the Conversation", addresses important strategies for ongoing implementation and support of the parties’ agreement. With the 25 years of experience the author, Patricia M. Porter, has provided her knowledge as well as her passion to help people manage and resolve conflict in their lives and work. I really needed to hear this book. I was able to see all my mistakes.